Mercury 75 to 150hp Fourstroke Sale Now On! Comments Off on Mercury 75 to 150hp Fourstroke Sale Now On! 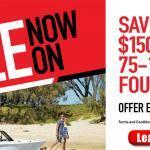 Get into Brisbane Marine now and secure a great deal on a Mercury 75 – 150hp Fourstroke. With up to $1500 off until May 31st, 2019 there hasn’t been a better time to save. Call Danny on (07) 3889 3033 (extension 1 for sales), or pop down to Brisbane Marine at 306 Duffield Road, Clontarf, QLD, 4019.